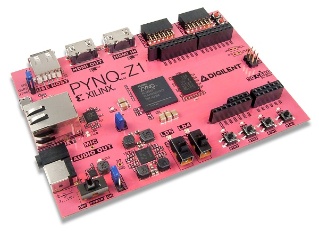 PYNQ is an open-source project from Xilinx that makes it easy to design embedded systems with Zynq Systems on Chips (SoCs). Using the Python language and libraries, designers can exploit the benefits of programmable logic and microprocessors in Zynq to build more capable and exciting embedded systems. Download PYNQ Image The PYNQ image is a bootable Linux image, and includes the pynq Python package, and other open-source packages. Vivado Design Suite: WebPack Edition The Xilinx Vivado® Design Suite is a revolutionary IP and System Centric design environment built from the ground up to accelerate the design for devices. One of the editions, WebPACK™, is FREE to download and provides access to Vivado features and functionality at no cost. It can be used to update the base overlay or create a new overlay.